I know I've seen the weave around somewhere but I cant for the life of me think of where it was or what its called... all I know is that I like it! I think what you have there is a single row of Dragonscale. Awesome! I've been using the tube clasps myself. I'm pretty certain that's what it is. It looks a little like Vertabre (sp?) 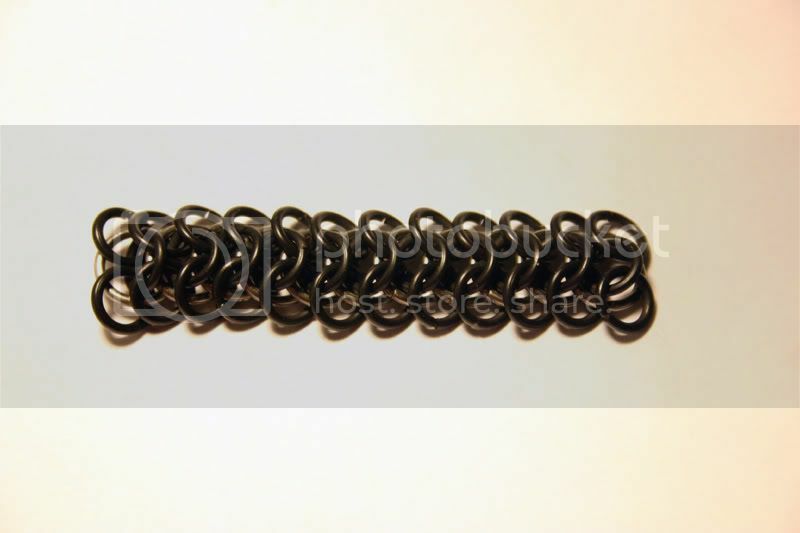 but it's not because the little rings inside have an offset position just like Dragonscale. I've never made DS as a single row so I don't know if it's easier that way or not, I'm gonna have to give it a go now though cause that really is a gorgeous bracelet. Great job. My first thought was that it looked like Viperscale, but I haven't done that yet, so I'm not sure. And, upon closer observation, research, and comparison, I am incorrect about that thought. My second thought was that it is just an E4 strip with larger orbital rings around the center row. Again, closer observation proves me wrong. Or not entirely correct, anyway. Current thought is that there is an E4 strip there and there is a larger ring orbiting the center row rings. However, it also appears that the outer row rings are linked through these larger orbitals making them not completely orbital. If it is indeed connected that way, it is not Dragonscale, but I'm not sure what it is. Well, I enlarged the 2nd pic and it doesn't look like DS to me. My interpretation is this... it looks like a strip of E4in1 with a larger ring encircling each connection, but facing the opposite direction from the center E4in1 rings and overlapping in that direction. It's similar to vertebrae, but the large ring doesn't encircle the center ring. I don't know what it is, but I like it too, and I'm gonna try it to see if I'm right. It did indeed start its life as a 20g 1/8' E 4-1 strip. I added 20g 3/16' rings (each connected to 2 other rings) and it just turned out like so! it looks great upside down too! any thoughts? I want to put a name to the thing! Hummm maybe not Dragonscale then??? I dunno, maybe we need more detailed pics and description, could be you have a new weave! 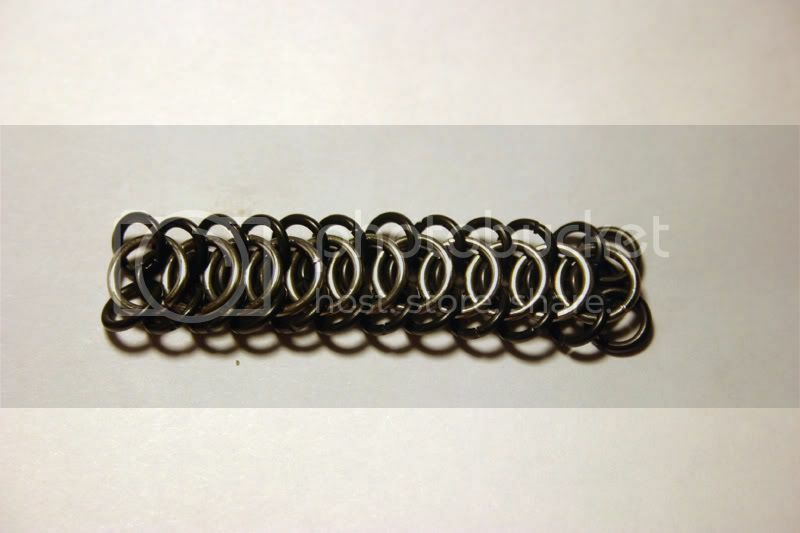 VERY interesting - after browsing the images provided I had to notice, that this weave is identical to one I attempted, when I probed around the "reptile" weaves, some months ago. Comparing the ring data given, I just didn't find the right ring diameters then, and so laid it aside. Dig, dig, Click!, upload... See yourself, what happens if the diameters don't fit. Human societies are like chain mail. A single link will be worth nothing. A chain is of use, but will break at the weakest link. A weak weave will have the need to replace weak links. A strong weave will survive even with weak links included. Well, if it turns out be a distinctive weave, how about Revert, as in reversed vertebrae, which is what it resembles to me. I think this would look great with some AA as the large rings. It could be worn with either side up, large rings up and it would have lots of color, large rings down and the color would be a more subtle accent. The weave lays great in either orientation. If its new, great discovery, if its not, thanks for bringing it to everyone's attention. OK the only thing I can find remotely like it is this. It's not the same but I would say in the same 'family'. So mention this and Valairis Dragonspine when you submit it and maybe a related name?? ?